With immense market knowledge, we have been able to provide optimum quality Low Pressure Casting Machine. The motor driven table top casting machine is fully automatic equipped with the centrifugal arm. The rotation starts while closing the door at the rated speed for a specific set time. The centrifugal arm transfers the metal from the crucible to the ring instantaneously. We have for our clients our cold chamber die casting machines that are high in performance. 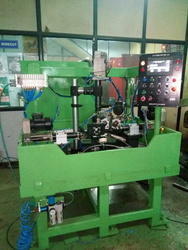 Having high precision and assured durability, these machines are known for their user friendly control features. Their superior functionality and optimum service life standards also ensure improved machine functionality as well as efficient operation standards. India has been well recognized by the world for its engineering knowledge and experience base with immense talent availability. Indian Casting and Forging industry has been identified by the major automotive leaders and auto-component companies to source their requirement of castings and forgings at lower cost as compared to the western world. We Also undertake all type of P.D.C Machine for reconditioning. We also provide warranty upto 5 years for all machines undertaken. - De-ox machine to produce de-oxidant shapes. - A complete range of shapes can be produced at high speed.